Well, it looks as if the implementation of the Goods and Services Tax (GST), which came into effect on April 1, has had a noticeable impact on sales of passenger and commercial vehicles in the country. 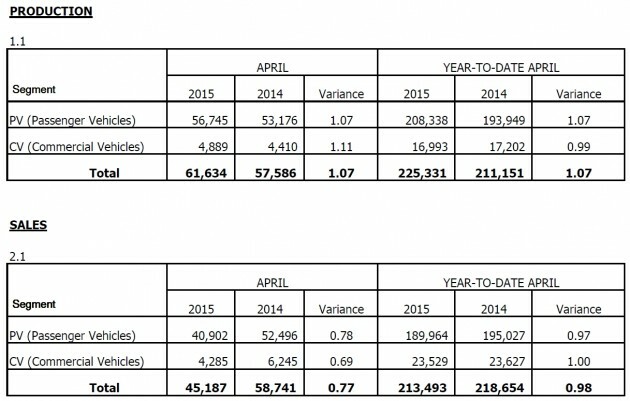 Vehicle sales in April 2015 amounted to 45,187 units in total (40,902 units passenger vehicles, 4,285 units commercial vehicles), which was 22,127 units fewer than sold in March – this amounted to a significant 32.7% drop over the previous month. The sales figure for April 2015 was also 23% lower than that of the corresponding month in 2014, down by 13,554 units. Year-to-date performance up to April for 2015 was 213,493 units sold, slightly less than the same period in 2014, when 218,654 units were shifted. The Malaysian Automotive Association said that the slump in April was due to consumers making an adjustment to the post-GST environment, and added that the significant difference in TIV figures for March this year was also brought about by consumers making vehicle purchases ahead of the implementation of the GST. The association said that it expects sales volume to be better in May as consumers become more optimistic now that post-GST prices have been revealed by the industry. Good news. Government should start reducing the tenure for vehicles financing so peoples money can be spent to other things. Be thrifty, if you are earning below 4-figure daily. Rm130k for a small puny B segment car? Have you sat in this car? Even the Myvi has more legroom. Where is Najib’s promise? Najib promised 30 million people 2 years ago before the election that he would reduce car prices by 30 percent. He said the 30 million people need not worry because BN always kept their word and never mungkir janji. He said if people voted for BN, he was 100% sure to reduce car prices by 30 percent. Najib also said that by 2020, we would become high income nation. He said our GDP per Capita would be US$48,000. That would mean, per month, the average Malaysian would be earning US$4000 (RM15,000) per month. Raja Nazrin, Sultan of Perak said this was pure lies. He said it is an utter lie because 78% all EPF contributors are earning RM1200 and below. Do you see the average Malaysian earning RM15k per month by 2020? Malaysians already aware how we are cheated. That is why we are not buying cars. Every Malaysian already realise they are being cheated on car prices and have been cheated for the past 30 years. First, Toyota does not sell the Altis in the USA. There is no equivalent version, as the closest US Toyota model is the Corolla which just a generic C-segment car in the USA like the Proton Persona is in Malaysia. Second, all the Hondas mentioned above are built in the USA with up to 80% American content. These are not CKD or CBU cars. The same is true with all the Toyotas mentioned (except for the Altis, which is not sold in the USA). Again, American sourced parts can be up to 80% of the vehicle, and they are not CBU or CKD units. The same again is true for the Kia Sorento and Hyundai Sonata, although their American content is much less. The Hyundai Tuscon, however is a CBU that is imported into the USA. With the luxury cars, both BMW and Mercedes Benz have factories building vehicles. Although none of the Mercedes mentioned are built in the USA, the BMW X5 is. The other Beemer models are imported as CBUs. Then there is the US price of the vehicles. They are out of date by at least a decade. They are higher now. Plus, the prices don’t necessarily match with those models sold in Malaysia. In most cases, if they did, the US price will be much higher than what you quoted. How are we to believe what you say when you got so many things wrong? Get your facts straight if you want some credibility. Comrade Jimmy,be thrifty even if u r earning 5 figures.Even if your pay is Rm 10,001, it is like rm 2000 ,20 years ago. After homeloan,car loans,credit card purchases,each month…practically you will be very blessed if u can save rm1k. 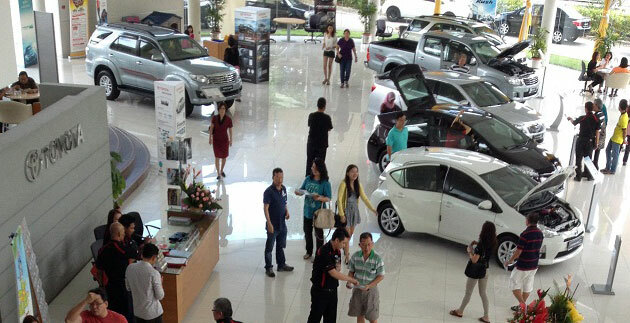 By right,car sales should not plunge 30 % in April cos some of those cars are actually cheaper. People are not buying new cars,simply cos too many things suddenly attract 6percent GST. For eg,lately my car repairs came up to rm2k.OMG, GST is rm120!!!! Rm120 can buy 6 packets of rice..can last me 6 months. WTF….why is the botak taxing me rm 120 for car repairs? In Australia,at age 65 citizens get state pensions.GST at 10 percent is justifiable there.If you are jobless, you get dole.If you are paralysed,or feeble at old age…they have aged care workers to wash your backside with one phone call. In Bolehland…what do u have?Empty election promises. Except for some,we simple ask for a MORATORIUM on buying new cars for 3 months.Sam Loo will come knocking at your door,offering rm10k discount for each Vios.Rm30K for each Camry. Go treat yourself with used cars…some in immaculate condition. By paying less for used cars,you also pay less hire purchase interest.Make sense? Simple..give more discount to entice us customers. For far too long the local car industry especially Proton has taken us for a joy ride now its our turn to take them for a joy ride with no sales. All the best amigo. Better buy 2nd hand. Now you can get 2013 Toyota Altis for RM65k. More worth it than paying RM139k for the new Altis. The RM85k you save, can help you a lot. I just saw on mudah, 2012 Godcar TRD RM48k, apa ni?!! Sam Loo, mohon pencerahan!! I am sure if you buy this used Godcar, you really will get good resale value. Unlike you buy a used volvo for 50% of original price and resell at 10% of original price after 3 years! Since when people buy Volvo for RV? Volvo never brags about RV, couldn’t be bothered with it. People buy Volvo for safety and comfort. They’re good at that, people just use them as long as they work. U can still see many Volvo 240, shows they can still work like a champ after over 2 decades, overpaying itself more than RV loss it incur. The journey matters more than destination. Unlike Sam Loo always preach RV, but now can see even Godcar can suffer near 50% RV loss in just 3 years. Sam Loo penipu scammer? Najib himself quoted saying that the BN government would reduce car prices by up to 30% gradually over 5 years and we should trust BN. Infact he said BN always keeps to their word. 9 months have passed and nothing has been done. Infact companies like Toyota and VW have increased their prices. Does not matter now whether a car is CKD or CBU or whether it is EV or EEV. What matters now is where is Najib’s promise?? This is why sales are bad. People just realized, Najib just tipu us. Also, everybody scared 1MDB will collapse the country and make Malaysia bankrupt. Time to buy a car ! never been a better time to negotiate. Cost of living is getting higher and higher. Do not buy unnecessarily thing frequently, think trice. Car loan is 3 years maximum. That’s the car that you can really afford. I think 6-month income is a bit unrealistic for the lower income group. Government screw their own bangsa. Own bangsa suffering with high cost of living and GST. But we got time to buy a new RM500 milion jet for PM whilst he has 5 other jets parked in the hangar. Stop buying for a couple of months. Differ the buying for at-least next three months and your will see how the industry panics and start giving heavy discounts. Car companies will give offer for Raya times. if the sales is still lower during the raya carnival, it will have a major impact. By third quarter car companies will die to push out their stock with very heavy discounts, special finance packages ..
Delay the buying and ultimately we win !! i said stop/delay buying until the distributors pressured the G to reduce tax. their few voices could b easily heard than the millions of rakyat voices. Very GOOD !! Especially those that increase price after GST. It’s not only that. Many of us also have to consider the rising cost of living. While yeah cars are cheaper, let’s not forget that as the models were introduced since 2014, there has been a trend of revising up prices. If there was a clear guide on how GST was gonna be applied on motor vehicles you would not have this issue. But unfortunately we have idiots running the show, so no surprise they make the rules as it goes. exactly. the statement about “The association said that it expects sales volume to be better in May as consumers become more optimistic now that post-GST prices have been revealed by the industry.” is not correct. they are looking at car prices in isolation. the consumer’s pockets are being hit from all corners – not just car prices. fuel, food, schooling, misc fees, insurance, etc. everything is hit by GST. Pre-GST March and April has boosted sales..
later May and june report will gradually back to normal. It was the car dealers short sighted idea to promote sales before GST. They’ve been saying the car prices gonna increase post GST. Now, they’re paying dividends for their action. PM Najib, before you volunteer to step down either willingly or by force, please fulfill your forever famous 30% car price reduction. Since you don’t care Tun M. advice, why should you care with Proton Advisor. At least ppl see the promise has been fulfilled with dignity for whatever circumstances that may come. We are paying market price on petrol. What else is the excuses. ? Well, as I has been anticipated sales will slow down but I did expect to be 30% reduce. I hope this offset the spike in volume of sales in pre-GST. It coming to 2nd QTR, if inventory still not reducing, then another round of marketing promotion comes to play. Stop buying especially after festive season will send some rational message to distribuibutors, give Ford Some Darby a learning curve in pricing their cars. No worries. Sales will pick up pre-Raya. This Raya the discount will be tremendous in order to compensate for sales lost. Wait next month for better offer. I believed many not buying car because of economic uncertainty. Not so much of the price. Car will be the last thing in mind as for now. Secondly, the post-GST prices of the vehicle is completely a big joke, the anticipated price drop is less than expected! We should see 4% of price drop (at least also 3% plz?) in the cars especially those CKD ones and national cars but instead some merely give a 0.5% off after GST. Come on la, say car becomes cheaper already, by RM100 to RM500 (certain cars), seriously? Some even increase price like Godcar. Padan muka UMW, now sales drop, become desperate even give trip to Japan, RM6k discount lel. This figure doesn’t actually tell the whole story. For some banks, loan approvals have gone down by as much as 80% due to tightening measures by BNM. It is virtually impossible to buy a car without D/Payment already which is unfortunate for the 1st time buyers. Come 2nd qtr….sales will drop further. Discounts wont work this time around. HaiZ…not only car ..everything includ3 my biz also being infected..Ahmad maslan and gov happpily announces collected 1 billion more being collected while million of Malaysian sadly pressure by evil gov…. For those who want buy car and want 30% discount, please stop buying car now! Wait for half year and you should get 30% lower. No need wait for Ah Jib’s promises. Hopefully it will become a buyer’s market and with it, all car makers will offer better safety equipment all around. For far too long some of the local and non-local car makes have been giving us cars that while expensive, lack basic safety features found in the make’s home countries or in first world countries. The Japan version of the Axia has VSC and 4 airbags! I wonder why P2 does not want to include these safety items is beyond me. Are Malaysian lives no less important than Japanese lifes? Triton in Australia has SEVEN (7) airbags and comes with active stability control. There are many more examples you can see just by going to the relevant manufacturer’s website in Japan, Australia, US or Europe. The irony is that some of the cars comes from the same factory in Thailand or Japan etc but without the safety equipment spec in. So when you shop for a new car, do ask if the car comes with at least stability control/ESP/VSC/VDC. This is expected given that this is the post GST ripple effect. Everything going up in price, so one have to attend to necessities first before they even dare think of purchasing a new car. Thanks to the ever increasing inflation in our country!